This page is written by the game's inventor, Larry Smith. SOLDIER(S) step one forward orthogonal before entering the "river". Upon and after entering the "river" step one forward, right forward or left forward orthogonal, or right or left diagonal. HORSE(H) step one vacant orthogonal then one diagonal in the same direction. CANNON(A) slide orthogonal through vacant cells, may leap any one piece to capture an enemy. ELEPHANT(E) step two diagonal and never cross the "river". MANDARIN(M) step diagonal and never leave the "palace". GENERAL(G) step orthogonal and never leave the "palace". Not permitted be on an empty file with the opposing GENERAL. The game is won by checkmating the opposing GENERAL. A player loses if stalemate or repetition of position. 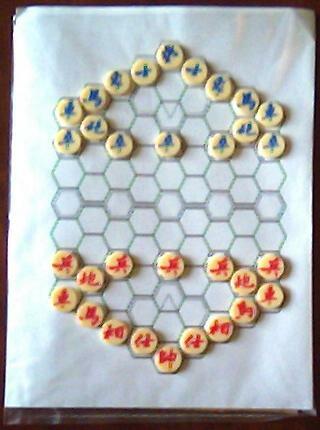 If both players have no pieces which can cross the "river", the game is drawn. I like attempts to extend notable chess variants onto hexagonal boards. I also would suggest heavily-orthogonal variant: elephants moves as non-leaping dababahs (able to enter the river, but not cross it), and advisors moves as wazirs, and general still have only orthogonal moves. But i love, how it plays with standart diagonal moves as well. It is good variant. So good that I choose to play it at Swiss Hippo Tournament #2. http://swisshippo.blogspot.com/ It looks aesthetically nice. Chariot, cannon, knight and pawn are stronger than in Xiang Qi. Chariot in the center of the board controls 26 hexes (1\3 of the board!). To make defensive pieces stronger, I offer three ideas. 1) Elephant-move. Elephant moves like Hex Bishop just limited with the river. Can enter the palace. Or more conservative: Elephant can move one or two spaces diagonally. 2) Advisor (mandarin) move. Advisor moves orthogonally, not diagonally. 3) General move. General moves orthogonally and diagonally, so like a king. I like first and third. Maybe this ideas can be used in Xiang Hex 2 (modern variation)... I will think about it! I don't want to change this game, till somebody doesn't show path to forced win. Just to offer another variant... I'd prefer to play with stronger Elephants. It is easy enough to simply say that a game is somehow 'damaged' or 'incorrect'. It is another to specifically demonstrate these claims. So far, those who have posted negative comments about this variant have done so without specific examples to demonstrate their positions. And to apparently done so to merely draw attention to their personal variants is very uncool. To exactly extrapolate XiangQi to the hexagonal field may prove virtually impossible. For various reasons which have been stated further down the thread. The best a developer can hope is a hexagonal game which has the 'flavor' of XiangQi. And, yes, there are a large number of variants which have attempted to do this. So to expect any hexagonal game of XiangQi to exactly match each and every dynamic of the square field is just silly thinking. Or is it simply forcing a personal viewpoint as an implied standard? I look forward to anyone who can demonstrate that this particular game is 'flawed'. This should be done with a specific in-game demonstration. To further justify there should be an example of how the player reached, or forced, this supposed 'bad' position.